Since 1980, Central Carolina Scale has been providing outstanding weighing equipment and scale repair service for our customers. Our truck scale calibration and inspection service is what our customers depend on to keep their scales accurate and dependable year round. Most customers choose to have their truck scales checked and calibrated at several predetermined points during the year. We can customize your service based on your needs and requirements. And, by choosing this method of periodic scheduled service; the customer benefits by receiving priority scheduling, reduced labor rates, and discounted parts. Before our factory trained, state certified scale technicians hit the road, they perform all mandated DOT vehicle inspections. Safety has always been a top priority. Once our scale technician reaches the job site, the technician will notify the customer. Then the technician blocks off the scale to keep trucks from entering during the inspection and adjustment period. 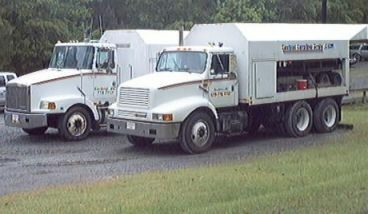 Keep in mind, Central Carolina Scale works with our customers truck traffic to be as accommodating as possible. The next step in a truck scale inspection is to inspect all critical components. Depending on the scale, the technician checks for buildup of dirt, sand, mud and debris underneath the scale. Dirt buildup under the scale platform is often one of the top reasons for scale inaccuracy. If the scale has bumper bolts, the technician will examine these and adjust if necessary. It’s also a good time to look at any other areas that may need to be addressed periodically such as junction boxes, grounding, rubber t-grip molding, load cell caps, pit cleanliness and more depending on the type of scale. The technician also checks cabling, structural steel, and concrete approach pads. Next, the scale technician will drive the fully loaded test truck across the scale and check the sections for consistency and accuracy. Weights are recorded and used to assist with adjusting. Next, the technician unloads all the certified test weights into a specialized weight cart. This cart is also certified by the state weights and measures department and is traceable to NIST. Then, the technician checks each section of the motor truck scale. When we mention the word “section” we’re referring to an area of weighbridge which bears on two supporting platform points. Once the section testing of the motor truck scale has been completed, the scale can be adjusted and calibrated if needed. 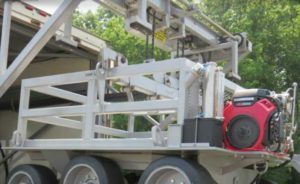 The technician can once again drive across the sections with the fully loaded test truck which includes the certified weights and certified weight cart. The section weights and the overall weights should be consistent and accurate. The calibration and inspection is now complete. The technician loads his vehicle and reopens the scale for traffic. Once the technician has moved off the scale and the scale has reopened, the technician completes all the necessary paperwork. The inspection detail report shows both the condition of the scale and components, as well as the as found and as left test results. 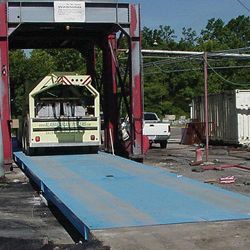 Central Carolina Scale has the factory trained technicians, certified test weights, and certified test carts to accurately and thoroughly check your vehicle scales. Give us a call today (919) 776-7737 and we can work with you to customize a service plan that will improve your accuracy and limit downtime. Keeping your Truck Scale well maintained and clean is an important part of truck scale ownership. Not only is it good practice to keep your weighbridge clean, it also contributes to a pro active scale maintenance plan and can significantly reduce the risk of equipment downtime and inaccurate weighing. Before we get very far with this entry, lets clarify one thing… When we say to clean your truck scale, we are typically referring to the areas where mud and dirt can build up and cause weighing errors. Having a pristine scale diamond tread platform is great but that is not what we are referring to when we ask, is your scale clean? You can see in the picture below an example. The photo on the left shows the scale before cleaning. Notice all the dirt on top of the concrete, especially between the approach ramp and the scale? Now look at the photo on the right after cleaning. You can see the concrete and very little dirt is left at all. Over time, the build-up of mud and debris can have a negative impact on a weighbridge performance. 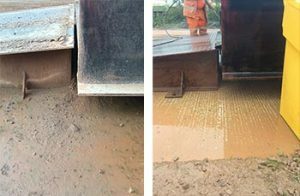 Compacted mud can set hard and reduce the movement of the weighbridge. This in turn causes reduced accuracy in weighing. Certain types of site environment will suffer more with mud and related issues and weather conditions can also play a part. Keep in mind, weighbridge cleaning can be a balancing act. You need to remove the mud and buildup so the scale platform can perform correctly. However, the water jet force required to remove dirt and debris from around a weighbridge’s critical weighing points can, if not performed correctly, damage load cells, cables, junction boxes, and summing boards. When cleaning the scale, the lightest amount of water pressure you can use and still get adequate cleaning, the better. Weighbridge maintenance should take place as part of a daily or weekly routine depending on the type of site. The build-up of debris and water should be monitored and obstructions should be removed from beneath the scale to provide clearance between the weighbridge and the ground. Otherwise, your scale accuracy will suffer. Pit weighbridges should be checked to make sure clearances are clean and the correct gap between the deck and pit wall are in place. ‘T’ section rubber can be used to help maintain gaps and should be replaced if worn or damaged. Regular end-middle-end tests with a loaded truck should be carried out to review the accuracy of the scale to see if there are any buildup issues. This basic cleaning and maintenance can be carried out by a site foreman or truck scale weighbridge operator. If you are a current customer and you are curious about cleaning your truck scale, contact us and we can discuss this further or we can show you the key areas during our next scheduled maintenance visit. If you’re interested in our services, please contact us at (919) 776-7737. I was reminded a couple of weeks ago just how valuable it can be to have a smart and knowledgeable service technician work on your project. In my case, it was my upstairs air conditioner. I put in a new AC unit probably 2 or 3 years ago. When I received quotes from different contractors, they were split on what size unit to install. About half said put a 3 ton unit in and about half said to upgrade and put in a 3.5 ton unit. I put in the 3.5 ton since my upstairs is having to heat/cool a lot of square footage. Anyway based on what I’ve seen over the past couple of years, I probably should have gone with the 3 ton. Our 3.5 ton unit seems to short cycle and doesn’t get rid of humidity as well as I would like. Truck Scale Spring Maintenance Is Important! Summer will be here before you know it and if you haven’t had your truck scale tested and inspected lately now is the time. The changing of the seasons brings us warm weather, but it also brings running water to truck scale pits and foundations. If left unmaintained, the mud and debris can wreak havoc on truck scale operations and accuracy. We recommend completing the following steps to ensure your scale is up and running in time for the busy summer season. You, the scale owner, can actually do quite a few of the steps below. Take a walk around the perimeter of your scale. Examine the entire deck, scale pit, foundation and approaches for any major structural or surface problems. If you see any foundation deterioration be sure to fix it right away. Any deck and approach repair is not merely cosmetic; those issues can have a negative effect on the scales performance. Flaking rust and crumbling concrete falling into the pit will add maintenance costs now, but in the future they will reduce the scales’ usefulness. We’ve been servicing truck scales for a long time and the most common cause of incorrect weighments is debris under the scale (or in the pit) binding movement. Clean all dirt from each component. Remember, even though most scales these days are electronic, they still have moving parts underneath. Load cells still need to be able to deflect through their capacity range. Scale Calibration Frequency: How Often Should I Calibrate my Digital Scale? We’ve actually covered the subject of how often to calibrate a scale before but it’s always a good idea to remind customers just how important the accuracy of their scales can be. We get this question fairly often so today with the help of Doran Scales we’ll take another look at why it’s important to have your scales calibrated on a regular basis by a trained scale technician. What is the value of the product to be weighed on the scale? If the product being weighed is very expensive, there is value in regular and periodic inspection and calibration. For example if the product costs $10 a pound and on an average day 1,000 pounds of product is weighed on the scale, the total value is $10,000. Let’s assume the scale is out of tolerance by 0.5%; that discrepancy would be $50 per day, $250 per week, and $1,000 per month. Obviously, eliminating this error would save a tremendous amount of money and more than pay for the calibration services. Is it a legal-for-trade application? If you buy or sell product based upon weight using your scale, it will need to be inspected and certified by the State or local Weights and Measures Department at the time of or shortly after installation. If a scale is tested and found to be out of tolerance or if products in the field are found to not meet the stated weight, Weights and Measure can condemn the scales so that they cannot be used until recalibrated, and literally shut your production down. How many weighments per day and at what % of scale capacity? Generally speaking, with time and use scales can start to lose accuracy. It may be a tiny error but over months and years it can grow to unacceptable levels. Think of it in these terms: when you buy a new car, you can expect that the wheel alignment will be exactly accurate. When this same car has 75,000 or 100,000 miles on it, the wheel alignment may need to be adjusted due to normal wear and tear. The same idea is true with your scale. Regular calibration of heavily used scales will correct any accuracy errors that will normally occur with this type of use. Are the scales frequently moved around in your facility or from one location to another? Doran scales are designed to be portable, in the sense that they do not require a permanent installation location. However, many times when scales are moved, they are handled incorrectly, resulting in damage that can affect the calibration and accuracy of the unit. If your scales are constantly being moved around in your facility or moved from one location to another, regular calibration will help keep them accurate and reveal any damage that may have occurred when they have been moved. What will it cost me if I don’t buy a good scale?